Credit cards are a convenience for people; they allow us to have what we want with just one swipe or signature, and we don’t see the bill until the end of the month. Generally, most people don’t pay off their credit cards entirely and carry a balance, a balance that is subject to interest and penalties for late payments – money spent for the privilege of using someone else’s money. It hurts consumer-buying power and affects credit scores in ways that reduce the individual’s ability to obtain credit and finance large purchases. When we make minimum payments on our credit cards we are kicking the debt can down the road, the piper will be paid at some point and the longer it takes to make the payments the more it will cost in the long run. By paying more monthly, you relieve yourself of costly financing charges and you aren’t spreading the debt repayment cycle over many years – it comes down quickly and in turn, the interest charges become smaller as they are applied to a smaller balance every month. Another benefit to paying down credit card debts quickly is an improvement to your personal credit utilization. Credit card debt is approximately 30 percent of your credit score, and if your usage is high, it will impact your score negatively. If you are judicious in the use of credit, you can protect your credit score, ability to finance purchases, and avoid bankruptcy. 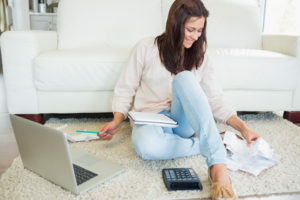 If you intend to make a major purchase, like a house, it is important to get your credit card balances down and get out of debt as quickly as possible. Lowering the balances will help when shopping around for interest rates and increase your ability to qualify for the credit you need to finance your home. The last benefit to paying down your credit card balance is the ability to use the cards. If you have a high balance on your credit card, and very little in the way of limit left the credit card is virtually useless. Paying down balances provides room under the credit limit to make purchases, and it improves your credit through credit utilization. If you are carrying $2000 worth of credit card debt at 14-per-cent APR and only paying minimum payments, you will pay $1833.24 in interest. Conversely, if you pay $100 per month on the same balance, and add no future charges, you will pay a scant $290.77 in interest. Let’s take a look at this from another direction, payments over time. Starting with the same debt of $2000, at 14-per-cent APR, making minimum payments would equate to 14 years worth of payments. Same debt, same APR, same $100 per month payment and the debt is repaid in just under two years – with the proviso that you add no more debt, and the APR doesn’t change. There are many benefits to paying credit card debt quickly, and if you can manage your credit card debt effectively you make the most of the available credit you have. To find out more, contact a debt specialist today.